Although all three products—hemp, contain (THC), a compound that produces psychoactive effects in humans, the variety of cannabis cultivated for hemp has only small amounts of THC. Hemp is grown in temperate zones as an annual cultivated from seed and can reach a height of up to 5 metres (16 feet). The slender stalks are hollow except at the tip and base. The leaves are compound with palmate shape, and the flowers are small and greenish yellow. The fibre, longer and less flexible than flax, It is strong and durable and is used for cordage—e.g., twine, yarn, rope, cable, and string—and for artificial sponges and such coarse fabrics as sacking (burlap) and canvas. In Italy some hemp receives special processing, producing whitish colour and attractive lustre, and is used to make fabric similar to linen. In 1940 a film promoted the production of hemp for the U.S. war effort. The edible seeds are source of protein, fibre, and magnesium. Shelled hemp seeds, sometimes called hemp hearts, are sold as a health food and may be eaten raw; they are commonly sprinkled on salads or blended with fruit smoothies. Historically, the seed’s chief commercial use has been for caged-bird feed. 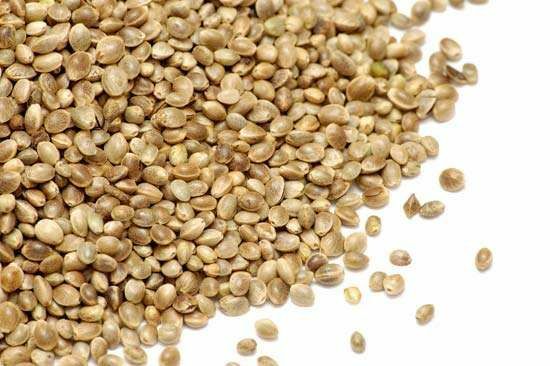 Unshelled hemp seeds (Cannabis sativa). AdstockRF .Although only the hemp plant yields true hemp, a number of other plant fibres are called “hemp.” These include Indian hemp (Apocynum cannabinum).